Won't You Join Us at our Upcoming Events? Please join us as we pray for an increase in vocations to the priesthood and consecrated life for the Archdiocese of Milwaukee and for the seminarians at Saint Francis de Sales Seminary. The Holy Hour includes exposition of the Blessed Sacrament, prayers and rosary for vocations, sung Divine Mercy chaplet, period of silence, scripture with reflection, and Benediction. A social will follow. Please join us and bring a dish to pass! We are especially pleased to see families and young children join us in prayer! Click here to view and print the promotional flyer for the February Holy Hour. Click here to pray the Holy Hour prayers at home. by a First Communicant, Eucharistic procession with rosary and hymns, reflection, Benediction. This is an outdoor event - please bring a lawn chair to sit on. First Communicants are invited to wear their First Holy Communion attire. Each First Communicant in attendance will receive a blessed rosary. 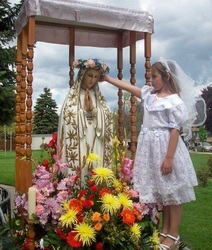 Click here to view and print the promotional flyer for the May Crowning. 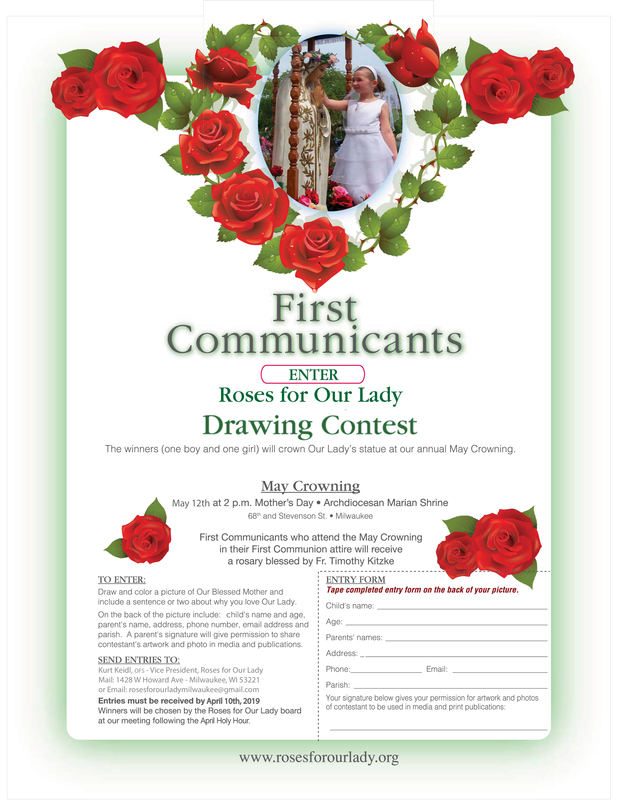 Click here to enter the First Communicant Drawing Contest to crown the statue of Our Lady! Please note: There will be no Holy Hour at the seminary in May. Enter at the South Gate - entrance to the Mass and procession is free with non-perishable food item for the Hunger Task Force, and then you are able to enjoy the good Italian food and music after the procession. 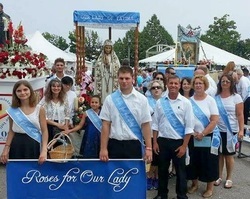 Join Roses for Our Lady as we carry our vara of Our Lady of Fatima and pray the rosary during the procession after the Mass. Benediction of the Blessed Sacrament follows the procession. Members are asked to wear white tops and black bottoms, and will be given blue sashes. Click here to view and print the promotional flyer for Festa Italiana. The celebration will include a Holy Hour with outdoor Eucharistic rosary procession followed by a birthday party celebration with birthday cake and coffee. Please bring a nonperishable food item for a local food pantry as a birthday gift to honor Our Lady. View and print the flyer here.